Music and movies get along just fine of all time. Good movies aid the fair-sounding music to go viral, and vice versa. Whether it is A hard Day's Night in 1960s with the Beatles' classic "I Love Her" and the ecstatic "Can't Buy Me Love. ", or Lords of the Rings (2001-2003) with "Keep It Secret, Keep It Safe" and "May It Be". Here are the best movie soundtracks of all time, which are unfailing and worth your downloading for repeated appreciation. Fifty Shades of Grey is without doubt among the highly anticipated movies in 2015, and facts prove that it deserves the waiting. Along with it come the 16 beautiful Fifty Shades of Grey songs which, on top of two Beyoncé songs Crazy in Love and Haunted, features Ellie Goulding, The Rolling Stones, and Frank Sinatra. Two singles from the album, Love Me Like You Do from Goulding and Earned It from The Weeknd, have already been released and enjoyed great popularity, and both songs cracked the top ten on Billboard's Hot 100. The Marvel's 2014 blockbuster movie Guardians of The Galaxy became a big hit in the summer 2014, and its soundtrack fellow its suits. The colorful soundtrack of Guardians of the Galaxy: Awesome Mix Vol. 1 compilation featuring music from the film has hit No. 1 in the iTunes chart featuring tracks hand-picked by director James Gunn and becoming the second chart-topping soundtrack of 2014. Those songs including Hooked on a Feeling, I Want You Back and other 16 can easily one of the most memorable parts of the film. How about the top Disney movie soundtracks in 2000s? Guess which one will go to the list? Of course the well-received Let it Go from Frozen (2013), the red-hot Disney soundtracks Immortals and Boca Dulce Boca from Disney Big Hero 6 (2014) and the song Cinderella at the Grave from Into the Woods (2014) rank among the top. They are skillfully infused into these Disney kids and have a significant role in expressing Disney movie themes. It's no exaggeration to say that Twilight series movies are the most popular vampire-themed movies so far, which make box office marvel one after another from 190 million dollars to 300 million dollars. And the Twilight soundtracks also make known to every individual, like the best Twilight soundtracks Decode, Full Moon, Leave Out All The Rest, Where I Come From, Bittersweet, etc. Almost any song from Twilight soundtracks can bring your memory back to the complicate love among Bittersweet, Edward and Jacob. The representatives of best 90s movie soundtracks go to the well-known Notting Hill soundtracks and Pretty Woman soundtracks. And the must-listen and download songs from Notting Hill soundtracks are the No Matter What, You've Got A Way, I Do (Cherish You), She and Ain't No Sunshine. Also the recommendable songs from Pretty Woman soundtracks include the gleeful Wild Women Do, Fame 90, King Of Wishful Thinking and Oh Pretty Woman. Unfamiliar with these best 90s music from movies? Go to Spotify or YouTube to entertain yourself. Have ever listened to the above best movie soundtrack music? If no, go to YouTube to listen to these top film soundtracks online with no charge needed. But what if you are located in a place where you can't get the stable internet connection or powerful Wi-Fi? Then download the best movie soundtracks from YouTube (or other 300+ online music video sites) regarded as the second-to-none choice, for in this way you can enjoy the sweet music without worrying any network issue. Prior to call the task of downloading top movie soundtrack songs begin, you are required to seek for a professional yet powerful music downloader. 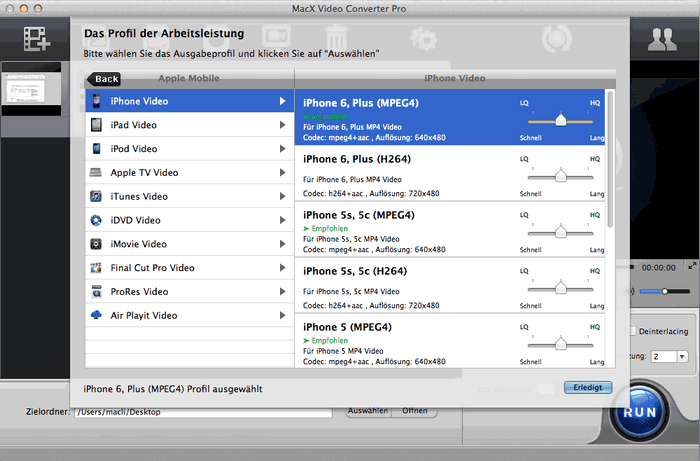 Here the best all-in-one MacX Video Converter Pro lives up to your expectations at this point, which enables you to download best Disney movie soundtracks of all time with 83X faster speed and 1:1 lossless quality reserved due to its advanced Intel QSV/Nvidia/AMD GPU HW acceleration and High Quality Engine supports. Better still, with the advanced tech aids, this top-rate music downloader can let the top movie soundtrack music download with whatever formats and resolution, like MP4, AVI, FLV, 3GP, MKV, HD video in 1080P, 4K UHD, etc. And for those users who wanna download the best movie soundtrack songs for playback on iPhone iPad Android, this considerate video downloader will satiate your demand with up to 420 preset profiles offered to you so as to convert your movie soundtrack songs to iPhone Xs Max/Xs/XR, iPad Air 2/mini 4, Galaxy Note 9/S9 edge, HTC, Sony, etc. for on-the-move enjoyment. How to Download Best Movie Soundtracks from YouTube and Convert to Mobile Device? Free download this superb movie soundtrack downloader & converter and launch it. If you are working with a PC, free download the Windows version. Then you can commence the top movie soundtrack songs downloading procedure with the following guide. Step 1: Click the button "YouTube", and you will see the window below. Put the target YouTube video address in the address bar and click the button "analyze". Or you may click the button "paste & analyze" to let the software detect the YouTube movie soundtracks automatically. Step 2: Then click button "Browse" to choose the target output folder. Step 4: Click the button "Auto add to convert" and the software will skip to the conversion page after downloading the YouTube movie soundtracks, and choose the portable device compatible format you need and start converting. 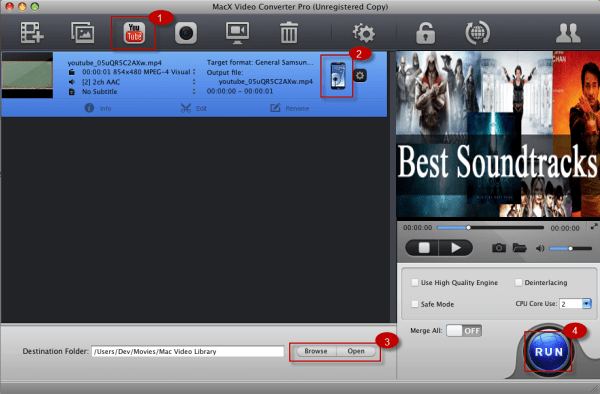 Believe it or not, MacX Video Converter Pro also delivers a seamless performance in converting your downloaded best movie soundtracks to MP3, MP4, MOV, AVI, AAC, AC3, iPhone Ringtone, WMA, etc. so as to playback on media players, handheld gadgets with maximum convenience.